Even though American Pharmacists Month draws to a close today, our message about the positive impact that pharmacists have on their patients, communities, and health care will continue to ring loud and clear throughout the year. So where was I? Oh yeah, I was recapping the standing room only NCPA post-convention program, Networking for High Performance Pharmacies; part of NCPA’s active leadership role on behalf of our members to put them in the best possible position as these trends continue and accelerate. On October 18th, students from three pharmacy schools vied in a live competition to be the winner of the 2014 Good Neighbor Pharmacy NCPA Pruitt-Schutte Student Business Plan Competition. For the second consecutive year, the University Of Oklahoma College Of Pharmacy (OUCP) was among the three finalists, having won the competition in 2013. NCPA recently asked the schools’ representatives for their insights and feedback on the contest. 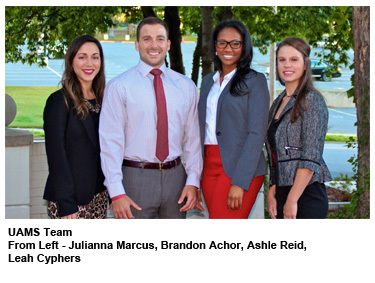 On October 18th, students from three pharmacy schools vied in a live competition to be the winner of the 2014 Good Neighbor Pharmacy NCPA Pruitt-Schutte Student Business Plan Competition. For the third consecutive year, the University of Arkansas for Medical Sciences College of Pharmacy (UAMS) was among the three finalists, having won the competition in 2012. NCPA recently asked the schools’ representatives for their insights and feedback on the contest. In 2004, NCPA held the inaugural pharmacy student business plan competition in which six schools submitted entries. Now starting its second decade, this competition has grown in popularity and participation with 42 schools entering in 2014. NCPA: What made you consider a career in independent community pharmacy and to ultimately enter this contest? Brandon Achor (BA): I have always valued the opportunity to personally interact with patients beyond simply handing them their medications. Independent pharmacy allows pharmacists to completely emerge themselves into their community and develop a relationship with their patients and their patients’ families. I believe this relationship uniquely positions the pharmacist to actively effect change in patient health outcomes and, in doing so, creates the type of pharmacy I want to practice. This contest motivates students to learn the “real-world” business aspects of pharmacy not normally discussed in the classroom. I knew that if I was truly serious about being an independent pharmacy owner, I needed to gain as much knowledge and experience as I could before starting my career. Julianna Marcus (JM): As my time in pharmacy school has progressed I have found that community pharmacy is where I want to spend my career. I love interacting with patients and being their go-to person for their health related questions. UAMS has been successful in the past in the business plan competition so I knew it was something I wanted to be a part of this year. I feel confident that we have a successful plan for purchasing a pharmacy and offering unique patient-centered services that are not currently offered in our area. Leah Cyphers (LC): My initial interest in independent pharmacy stems from my parents being independent pharmacy owners. After working throughout undergrad and pharmacy school in other independent pharmacies, my passion for independent pharmacy increased exponentially. Not only does this contest prepare me for pharmacy ownership, it is a learning experience I will never forget! Ashle Reid (AR): Independent community pharmacy creates an environment to hone my entrepreneurial spirit, while also giving me the opportunity to uninhibitedly serve and truly meet the needs of the community. NCPA: Have you previously attended an NCPA annual meeting? If so, what made you want to come back (in addition to competing in the live competition)? BA: I have been fortunate enough to attend the previous 3 NCPA annual meetings (Nashville, San Diego, and Orlando). Our professors harp on the idea that pharmacists are to be “continual learners” and I have found there to be no better place to learn or people to learn from, than the NCPA annual meetings. LC: I attended the NCPA annual meeting last year in Orlando. There is something about the rush of energy you feel when a large group of people who are all passionate about the same thing get together. I learned more that weekend than I ever imagined. I left there “fired up” for independent pharmacy!! NCPA: Can you sum up the highlights of your proposed plan to purchase or start an independent community pharmacy? BA: We developed a plan to purchase an existing pharmacy located in a uniquely diverse urban setting and to implement a patient-centered-medical-home partnership with surrounding clinics. LC: Our plan takes an already profitable pharmacy and incorporates a Patient Centered Medical Home (PCMH) through the primary care clinic located directly across the street from the pharmacy. NCPA: What makes the independent community pharmacy that you propose to purchase stand out from other retail pharmacies in the area? BA: Our pharmacy has served its community for over 120 years and is the only pharmacy within walking distance of several primary care clinics, residences, and local attractions. NCPA: For those who are unfamiliar with the competition, can you describe the time and effort that went into writing your business plan? How many hours a week? What was the most unusual or surprising thing you had to do in preparing? What about your preparations for the live presentation in Austin? BA: This was no easy task. Having seen several live presentations and listened to Dr. Jackson’s lecture “How to Write a Business Plan” at previous annual meetings, I thought I had a good understanding of the added work load that this project would bring. I was wrong. Our team averaged an additional 20 hours per week (on top of our other academic and extracurricular responsibilities) for almost 6 months before finally being satisfied with our plan. The preparation for the upcoming live presentation has more than doubled that since the end of July. The most unexpected difficulty in preparing for the live presentation was learning proper body language for when we are NOT speaking. JM: When we first started forming our business plan I knew we had a big task ahead of us, but it seemed like there were enough people that it wouldn’t become overwhelming. Each person was assigned a different area of focus (i.e. financials, marketing, etc.). We worked throughout the semester on our own and met weekly to discuss our progress. In May we met much more frequently as the deadline for the plan drew closer. The last week before the deadline was the most intense since we were trying to perfect the final details. The preparations for the live presentation were quite a bit different because all of us are fourth year students on rotations not only in different areas of Arkansas but in different areas of the country. While it has been challenging at times we have managed to make it work and are very excited to have the chance to present our plan. AR: There is not a day that goes by that I don’t actively think about our business plan. The hours of research, writing, planning, and practicing are too numerous to count, but it has been an incredibly worthwhile experience. NCPA: What else would you like to tell people about the competition? BA: DO IT! Regardless of how well you place in the competition, the business knowledge and experience you gain while completing this project are invaluable and create unique networking opportunities. LC: This is not just a competition. It is a way for student pharmacists to stand out as leaders and have a voice in our profession. NCPA: What advice would you give students who may be interested in entering the business plan competition? BA: Think outside the box. This competition pushes students to explore new avenues of community pharmacy practice and students should aim to develop unique and creative business models. JM: I would tell other students not to hesitate in entering the business plan. It is a challenging and rewarding process that gives a realistic idea of what it takes to become an owner of your own pharmacy. They should be prepared for a lot of hard work and some late nights, but if I could do it all over it again I certainly would! AR: The personal investment throughout this process is extensive, but the relationships built, networking, and the lessons in entrepreneurship have been and will continue to be invaluable. NCPA: Anything you’d like to add regarding your pharmacy school or NCPA student chapter? BA: I feel very fortunate to attend a university with such a passion for entrepreneurial pharmacy practice. I would like to thank our team advisor, dean, and countless other faculty members for their active support and encouragement. Go Hogs. AR: The current and past success of our chapter is anchored in the tireless efforts of our advisor, Dr. Schwanda Flowers. Her NCPA pedigree and her drive set the tone for our team’s success all while fostering a learning environment. First Place—$3,000 to the NCPA student chapter and $3,000 contributed to the school in the dean’s name to promote independent pharmacy. Second Place—$2,000 to the NCPA student chapter and $2,000 contributed to the school in the dean’s name to promote independent pharmacy. Third Place—$1,000 to the NCPA student chapter and $1,000 contributed to the school in the dean’s name to promote independent pharmacy. As an added bonus, the winning team will receive a mention in an upcoming issue of America’s Pharmacist.